With the holidays upon is, it is about that time for doing something I dread this time of year. Family Christmas photos. Do you know what an ordeal it is to get four boys dressed up nicely and then sit for a photo session? We originally used to bring them to one of those mall photo places which was always a disaster. The picture was always decent but so not worth the blood, sweat and tears. Last year we decided to try an in-home session with a local photographer. Having the photographer come to us made the world of difference. The photographer was nice and we loved the photo in front of our tree, but she designed an awful holiday card for us. Awful. So this year I have decided that my sister-in-law will take our photos with my DSLR and then I will order them myself online. Send out this year's holiday greetings with style. Your special photo will look great in these unique and modern holiday photo cards created for you by Minted's global community of independent designers. I have ordered our Christmas cards from a variety of places over the years, both online and in store, and I get so tired of the same boring designs. Minted offers a wide selection of unique holiday cards using a seamless design and ordering process. There are several card types to choose from: flat, folded and folded with storyboard. They even have an option for you to upgrade to 100% recycled paper. You can use their many filters to narrow your search down to cards that meet all of your needs and they have card that accommodate one photo or multiple photos. I spent some time scrolling through their many card designs and I found there were so many that I really liked. Usually I have trouble finding one that I think is worthy of my photo, but so many of these were really great. Pictured above are a handful of my favorites. Believe me, I could have added more. One of the most tedious parts of designing a card online can be uploading your photo and then testing how it looks in several different layouts. When you are limited to only seeing one design at a time, this can take a while. Minted has a "find it fast" feature which lets you upload a photo just once and then on one page it displays how your photo looks in a bunch of different cards. 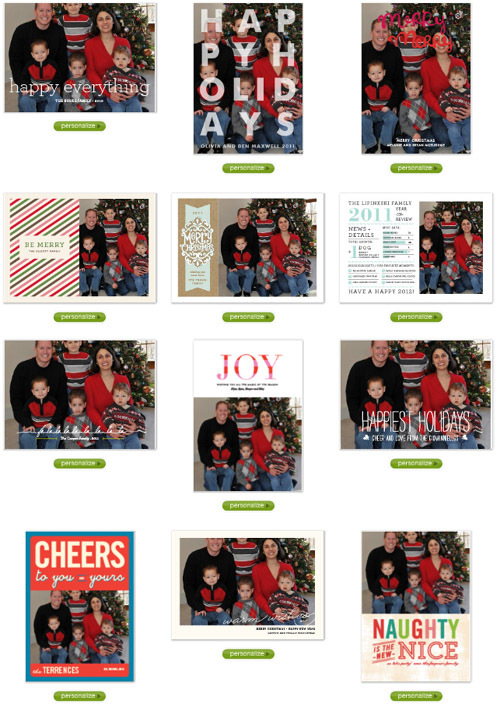 We have not taken our 2011 holiday photo yet, so I used our 2010 photo to see how this feature works. I absolutely love this feature! In once glance I can quickly see which cards don't go well with our photo or that I just don't like and immediately take them out of the equation. This saves so much time as now I can just focus on the designs that look the best. Of course the computer doesn't know where to crop your photo so these quick glances might not look perfect, but it gives you enough of an idea to be able to make a decision. After scrolling through the find it fast preview that Minted gave me, I decided to try out this photo card. I felt the presents were a good match for our Christmas tree photo. It took me just a few minutes to edit this card with my photo and text. Be sure you upload a high resolution photo for the best quality. What's nice is if you decide you don't like the card you are working on and go to customize another one, you don't have to re-upload your photo. It is already saved in your session which is yet another nice time saver. Once you finalize your card and options like the back of the card and envelopes, you can submit your order. 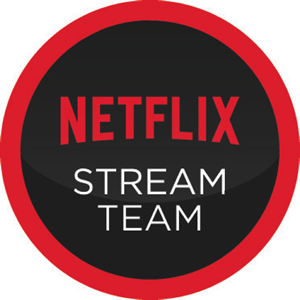 It will then be sent to a professional graphic designer to typeset and they will email you a digital proof to review. 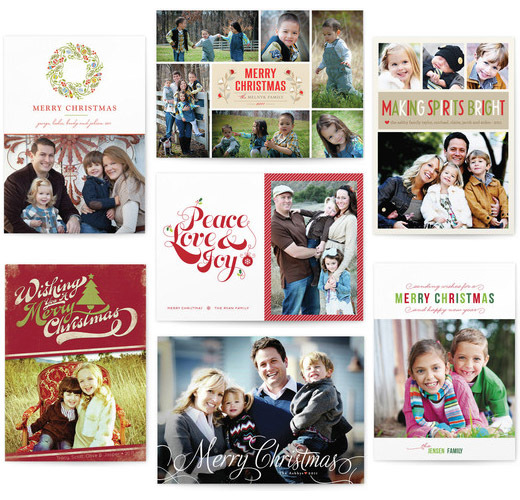 I am really excited to order our Christmas cards from Minted this year. I have not been happy with our cards the past few years but I know this year I will love them. We don't have our Christmas photo done yet; we usually put our tree up the weekend after Thanksgiving and then we will be able to get the photo taken. I still need to figure out our outfits for this year too. Once I have my Minted cards in hand, I will update this post so you can see how they turned out. 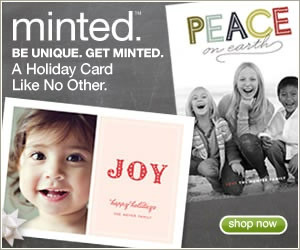 Minted flat holiday cards start at 25 for $64 and are available in increments of 25. 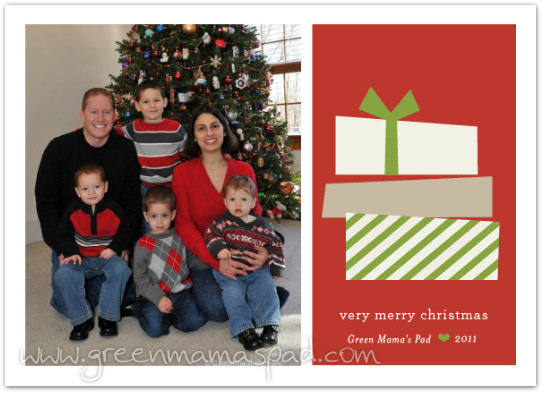 Minted is offering Green Mama's Pad readers 15% off their holiday orders. Use code READERS38. Expires 11/28/11. Those are cute holiday cards. I was thinking of having some photo cards made this year. These look great! I love the feature tha allows you to see all the different designs - classic and original!